Everyone now Has Their Own Media Company. How will you use yours? Figure out what you want first, then go out and sell so you can get it. It’s Dave Lorenzo and I am live in my kitchen. This is Facebook Live and everyone has been encouraging me to do this for the longest time. This is my first foray into it. I’m in a very relaxed state, wearing my New York Yankees 2018 playoff hoodie, got my cup of coffee, and we’re going to spend a couple minutes together today having a Tuesday Talk. This is Tuesday. It is January 15th, 2019. And one of my resolutions, call it a goal, was to really leverage social media this year. We’ll talk about how everyone can now be a media company, but the main topic of my talk today, is this notion of a messy success versus a neat failure. Messy success versus a neat failure. I just had a big two-day meeting, with some great clients here in Miami, and we made the dress code for this meeting, super casual. I said to folks, come as you are, wear jeans, be comfortable, because I want the content to be the star of this meeting. I don’t want people to really be focused on how they look. I don’t want them to be concerned about what’s going on with their appearance. I don’t want them to spend three hours in the morning doing hair and make-up to get ready to come to a meeting where you’re supposed to discover new ways to grow your business. So I said, be casual, wear jeans, feel good about what you have on, and focus on learning and growing. The casual environment, led to really candid discussion, which was great. One of the things I want you to think about is what’s more important, the outcome of your activity or the way you look doing it? I work from home. I’ve worked from home for the last 10 years, and then, before I had my own company, I worked from home on a part-time basis when I worked for someone else. I love working from home. I couldn’t be happier. I couldn’t go back to an office environment on a regular basis. It’s nice to go into an office and hang out with people, have conversations, and be a part of a group. That’s great. But there are other ways to get that. Working from home is absolutely fantastic. I get more done between 5:00 a.m. and 9:00 a.m. than most people do all day. And the reason is because I get up, I brush my teeth, I pour myself a cup of coffee, and I’m off to the races. I’m working without ever having to worry about showering, shaving, and putting on a suit and tie. One of the reasons why I want to do this Tuesday Talk with you in a casual way is because I just want to turn on the camera and point it and have a conversation with you. The idea is that the information here is more important than how I look. And for me, that says it all. I want you to focus on results and not on aesthetics. Of course, if you’re in retail or if you’re in pharmaceutical sales or you’re in any type of sales where you have to go out and be in front of the customer, you need to dress and look at least as good as your customer, if not better. But when it comes to setting the table for getting things done, you can work from home and make a lot of stuff happen on a regular basis. Those of you who are business leaders out there, entrepreneurs, people who own your own companies, think about how you can let your employees be comfortable and just focus on results. Let your sales people be comfortable, work from home, and just focus on results. If you’ve hired the right person, you don’t need to stay on top of them, you don’t need to be banging away at them. You need to dictate the results you want, and then just let them get to the results however they want to as long as it’s legal, moral, ethical, and it’s in alignment with your brand values. Work from home, be comfortable, make those phone calls in your underwear if you need to, connect with your clients on the telephone. In this day and age, the way I’m dressed right now, I could be a dot com CEO and be in an office. The new rules are: focus on results as long as you’re comfortable and you represent your brand well. Go ahead, be a messy success. The second thing I want to talk about today in today’s Tuesday Talk is what I started this conversation with, and that’s the fact that everyone is now a media company. If you’re in sales, or you’re a business owner, and you’re having a hard time breaking through, having a hard time differentiating yourself from everyone else, focus on developing your expertise. How can you develop your expertise and let the world know that you’re an expert? This is how you can do it (what I’m doing right now). You’re a media company. Go on Facebook, do a Facebook Live session every day. Go on YouTube, do a YouTube video every day. Write and publish new content on your website every day. Post those articles on LinkedIn. Connect with people and let them see the value of your expertise. You want an example? Alright. You are a roofer. You own a roofing company. I live now in Miami, Florida. It is January, and this is the time of year when people should be fixing their roofs. Hurricane season is from June to December. January to the end of May is when people should be going crazy fixing their roofs. You want to let people know that this is the right time to fix your roof, what do you do? Well, you go online and you take this camera up to the top of the roof and show people what a roof inspection looks like. Show them what bad roof tiles look like. Show them what water damage looks like. Explain to them why this is the time of year when they should think about fixing their roof, when it’s not raining vs the rainy season. You’re an expert on how to keep people warm, dry and safe, you’re not just a roofer. Let’s say you’re a plumber. Go out and show people what damage to pipes looks like when people throw baby wipes into the toilet. Take the camera, show them what damage looks like. Get down in there, do live videos, post those videos on YouTube so people can see what it looks like. Go to a construction job, show people what great plumbing looks like, show them what amazing fixtures looks like, show them the proper way to install a pot filler on a stove. If you’re a plumber, those how-to videos, doing them live, as well as doing them on YouTube and saving them, archiving them for people to look at, you can educate people, you can differentiate yourself from every other plumber on the planet, and you have a media company at your disposal. Use it. You know why you never get in front of the CEO? It’s because you’re not speaking the CEO’s language. You’re not going to the CEO and demonstrating that you’re an expert, and that’s why he doesn’t view you as a peer. So if you want to differentiate yourself as a sales professional, you want to differentiate yourself as a lawyer, you want to differentiate yourself as a roofer, you want to differentiate yourself as a plumber, use the media company you have at your disposal. That’s social media. Broadcast live, create videos on YouTube, write articles and publish them on LinkedIn, do the things that only large companies were able to do in the past, and when you walk into the CEO’s office, or when you connect with a homeowner, when the homeowner calls you for their roofing issue, when the homeowner calls you for their plumbing issue, they know they’re calling an expert. The final point today is: Figure out what you want first. What do I mean by that? I am working from home, and the reason I work from home is because one of my main goals when I turned 40 (ten years ago) became to be to raise great kids. I was a partner in a large consulting organization. I ran the New York office, I had a portfolio of businesses that was huge, and I was 40 and I didn’t have kids. My wife and I decided we wanted to start a family. So I focused on my main goal, and that was to raise great kids. So I looked at that goal, and then I built my life around that. I created my life around supporting my main goal. You can do the same thing. Go figure out what you want first and work backwards from there. You’ll see a lot of videos out there, a lot of successful people, a lot of smart people, will tell you that you must work 18 hours per day in order to be successful, that you have to hustle, all that’s true. But you can work 18 hours a day, or you can work hard, you can work smart, you can be successful, you can hustle, and you can still have the goals that you want. The way I’ve aligned my life, and we’re going to do more of these live videos to show you how I’ve aligned my life, to give you an alternative to the people who are out there running through airports and pulling people into meetings in big offices and stuff. The way that I’ve set up my life is as follows: From 05:00AM until around 06:30 every day, I work hard, I get my content, my daily content out onto social media. 06:30, my son gets up, I train him, he’s an athlete, he’s focused on mixed martial arts right now, so from 06:30 to about 07:30, I train him, my office is also my gym. Maybe I’ll do one of these videos from there, so you can see the office and the gym and all the equipment we have. And then from 07:30 to 08:00, I do breakfast with the kids and then the kids are out the door. And from 08:00 until about noon, I’m back at work, working hard. At 12 o’clock, my wife and I have lunch together, we work together, we have lunch together, as long as we’re both home. Then from 1:00 until about 4:15, I’m working hard again. And then from 4:15 until 8:00, I’m an Uber driver, picking up kids, dropping off kids at activities. Then we have dinner, we do story time, we say prayers and we go to bed. And then I edit. From the time they go to bed, from 9:00PM until whenever, last night it was midnight, I’m editing video, writing content, I’m pushing stuff out to you, the audience that is enabling me to be successful. So, today’s Tuesday Talk, if you missed it or if you’re just joining, we had three points. First, messy success vs neat failure. Which are you going to choose? Second, everyone’s now a media company, so if you want to grow your business, take advantage of this, take advantage of social media, take advantage of your ability to broadcast to the world, or at least to your little corner of the world. Third, figure out what you want first. You can have the life you want, and you can build your business around your life so you’re successful. This is today’s Tuesday Talk. We’re definitely going to do this again. 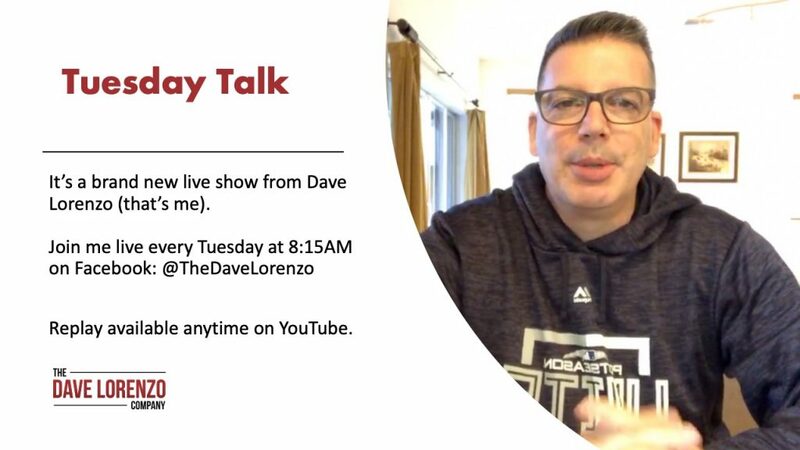 It’ll be probably every Tuesday at 08:15 unless I decide something different, so thank you for joining us, and if you want to see the replay of all these Tuesday Talks, you can go to my YouTube channel, that’s http://YouTube.com/c/DaveLorenzo . Thanks for joining me for the Tuesday Talk. We’ll see you back here again on Facebook very, very soon.